As simple as it sounds, your driver will meet you at the docks, and deliver you to Florence, providing to you an introduction of the region and the city. In Florence, you will stop at the Piazzale Michelangelo where you can enjoy the best view of the city! Be sure to get some more information and tips from your driver, as he’ll then drop you off in the central Piazza della Repubblica. At this point, you and the driver will arrange a pick up time for returning back to your boat. Time permitting; you may also arrange a stop in Pisa for a picture of the Leaning Tower, an unforgettable icon! A professional driving guide will meet your party at your boat, and take you to Florence, the heart of Tuscany! After a stop at the Piazzale Michelangelo for a photogenic view, you will meet your licensed guide for a three-hour walking tour of the city, including the Museum of the Accademia, Michelangelo’s David, Piazza Signoria, the Church of Santa Croce, and the Ponte Vecchio. After lunch and some time on your own—for shopping or just enjoying walking around the charming streets of downtown Florence—you will meet your driver to return to Livorno. 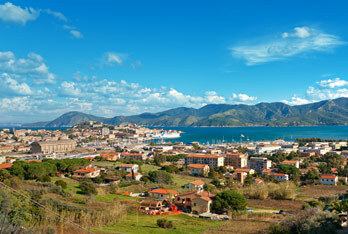 Your driving guide will meet you at your boat, and within a short amount of time you will be in Pisa. With your driver’s guidance, you will have some time to explore the Piazza dei Miracoli and take a picture of the Leaning Tower before heading to Lucca. Your driver will give you a general overview of the history of Lucca and the Region before dropping you off in the central Piazza Napoleone. After lunch you have the opportunity to walk around this charming town, see the Duomo, the Roman Piazza Anfiteatro, or have your driver arrange for bicycles so that you can take a nice, easy ride along the top of the walls, an excellent romantic getaway. By 4:30 PM you will meet back with your driver, for the return trip to your boat. Your expert driving guide will meet you at your boat and drive east towards the beautiful Chianti Hills. Along the way you will have the opportunity to learn about the history of the Region and the Italian wines, with a special focus on Chianti. Your first stop will be a winery for a private tour and tasting, before arriving at the town of Greve. Here, you will have lunch in a charming trattoria before enjoying an extra-virgin olive oil tasting at the Cantine di Greve. Time permitting; you will stop at the beautiful hamlet of Castello di Montefioralle, before returning back to Livorno. Your driver will meet you at your boat and take you to the heart of Rome, to meet with your licensed city guide. With the expert guidance at your disposal, you will cover and discover the major highlights of the city and take advantage of the driver to cover the distances in between, allowing you to take part in an unforgettable experience. Piazza di Spagna, the Trevi Fountain, The Pantheon, The Roman Forum, and Saint Peter’s Square are just some of the unforgettable places you will see and learn about before going back to your boat. Meet your driver directly at your boat who will take you to Rome. Your first stop will be the Vatican to meet with your licensed tour guide for a fascinating three-hour exploration of Saint Peter’s Square, the Sistine Chapel, and the Vatican Museum. After lunch, your driver will be at your disposal for showing you around the city, expertly navigating you through the busy streets and squares. You will see the Coliseum, The Forum, Piazza Venezia and much, much more before going back to your boat. If you don’t want to be part of one of those big tour buses and just enjoy Rome with your party, all you need is a local expert driving guide! He will meet you at your boat and take care of you while spending the day in Rome. He will provide all the general information you require and some basic history of the city. He will expertly navigate the busy streets, suggesting some great restaurants for lunch, or an interesting shop or so off the beaten path. Your driving guide will be able to take you almost anywhere in the city, especially in the pedestrian heart of Rome where the big buses are not allowed. Enjoy your day of touring in ease and comfort! 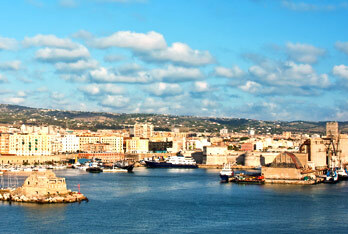 From the port of Naples or from Amalfi, the combination of tours we can offer are almost endless. Amalfi, Sorrento, Positano, Ravello, Pompei, and Ercolano to name a few! These are just some suggestions for tours from either port. Let us know where your boat is going to dock and we will tailor the perfect day for you. 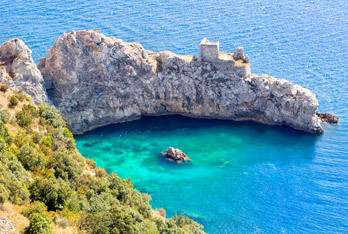 This full day is designed to give a complete overview of the most known towns on the Amalfi Coast. The English-speaking driving guide will take you on an unforgettable journey that will cover Amalfi, Positano and Ravello. You will ride in comfort through the scenic route overlooking the sea and the charming fishermans’ villages while your driver will tell you the history and the traditions of these world-famous jewels. In Positano you will be walking the charming streets, visit the Cathedral and have some time for shopping. In Amalfi you will learn about the old splendor of the town – once leader of the maritime traffic in the Mediterranean – and have time to walk around the fascinating streets and visit the Duomo, dating back to the ninth century. After lunch you will take the road that slowly climbs the mountain to reach Ravello. Once on top you will be stunned by a breathtaking view and the beauty of this hamlet, which has inspired artists from all over the world for centures. You will have the chance to admire Villa Ruffolo (with Richard Wagner’s favorite terrace) and Villa Cimbrone, once a retreat for both royalty and celebrities. The English-speaking driver guide will pick you up at the boat and take you to Pompeii in comfort, while giving you a general description of the history of the area. In Pompei you will meet your licensed guide for a two hour walking tour of the archeological site. You will follow your guide in a fascinating visit of the town destroyed by the eruption of Mountain Vesuvius in 79 A.D. This is a unique experience for understanding the life, the architecture, and the tradition of an old roman town; learn about everyday life and costumes in an interesting and intriguing journey that will take you 2000 years back in history! After the tour, you will drive to Sorrento, the busiest town in the area with an unbelievable view of the Gulf of Naples. Here you will have lunch in one of the typical trattoria or taste the best pizza in the world. The driver will take you to Positano for exploring the charming streets and some shopping before returning back home. This tour is a fascinating journey to two of the most famous archeological sites in the world – Ercolano and Pompei. Both sites were destroyed and buried in ashes by the eruption of Mountain Vesuvius in 79 A.D. Today, they are unique opportunities for learning about Roman civilization and understand everyday life as it was 2000 years ago. The driver will pick you up at the docks and drive to Pompei where, with the help of a professional guide, you will visit the excavations. Walking through the roman streets you will understand the high level of civilization, see the spa, the gym, the old mansions decorated with frescoes and mosaics that incredibly survived the eruption. After lunch you will get to Ercolano for visiting the remains of this old roman residential town. Here the lava in 79 A.D. has destroyed almost all the buildings, but incredibly a huge collection of furniture and manufacture was spared and is still visible. After the tour with the archeological guide, your driver will take you back to your boat. Contact IttM to request more information, or start planning your tour of Italy today.